Only the most serious badass can whistle the silly children’s song The Farmer in the Dell and turn it into a warning shot. But any fan of HBO’s The Wire knows Omar Little was that dude. Calmly strolling down the street, striking fear in the hearts of those who dared to cross his path. Hi-ho, the derry-o. “Omar coming,” is what they said in West Baltimore. “Serena coming,” is what they should be saying in Queens, New York. 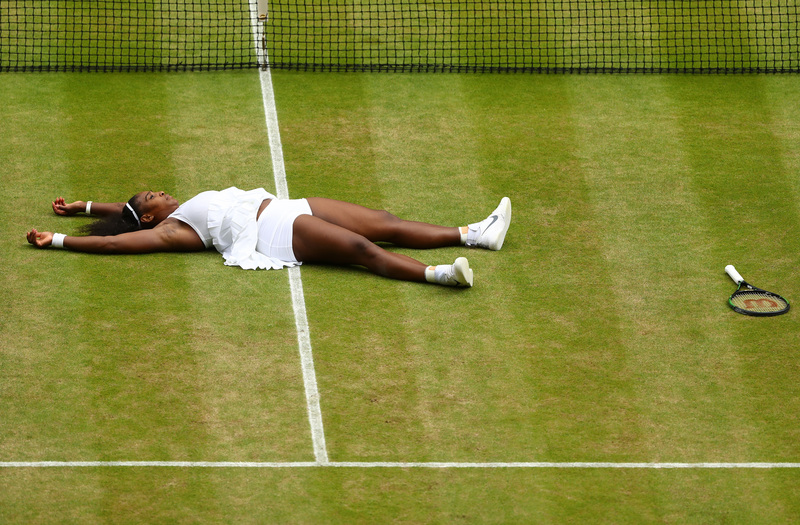 After her 7-5 6-3 victory in Saturday’s Wimbledon final tied her with Steffi Graf’s 22 for the most majors in the Open era, Serena Williams is now primed to break that record at the same site that caused her so much pain. Her shocking loss to Roberta Vinci in last year’s U.S Open semifinal, a loss that stopped her from becoming the first American to win all four majors in one calendar year, forced Serena into hiding. She took the rest of the season off to regroup. But even upon her return, she still seemed out of sorts, highlighted by her losses in the finals of the Australian and French Opens. Even at the All England Club, during a tense two-hour, 30-minute match in the second round against Christina McHale, she didn’t look herself. The turning point of the match, if not her year, came after she dropped the first set 6-7 (7-9). That’s when she walked over to her chair and smashed her racquet. Serena had no business being in a tight match with McHale, a player whom she had never lost to and who was ranked 64 spots below her, and she knew it. And though she leveled the McHale match at a set apiece, Serena was down 0-2, 15-40 in the third. You could hear the crowd’s conflicted murmur, torn between rooting for a huge underdog and wanting to see Serena make history. Much like that fateful day at Arthur Ashe Stadium where an overmatched Italian woman defiantly engaged Serena in a stare-down contest and surprisingly wasn’t the one to blink. Whatever aura of invincibility Serena managed to drag with her into 2016 had been eroded by the likes of Angelique Kerber in Australia and Garbine Muguruza in the final of the French Open. Then she went on to win 31 of her next 41 games — finishing off McHale, swatting away Annika Beck, and crushing Svetlana Kuznetsova in the process — and it became apparent. Serena was back. LONDON, ENGLAND – JULY 09: Serena Williams celebrates victory following the ladies singles final against Angelique Kerber of Germany. When she destroyed Elena Vesnina in 48 minutes — the shortest completed match of the tournament — Kerber had to know that the woman she beat in January was not the woman she’d be facing in July. This Serena arrived to defend her Wimbledon title, to tie Graf, to inform the rest of the tennis world that the teeny, tiny opening that might have been available to take her place as the game’s best has been viciously and unceremoniously closed. Serving for the match, she hit one huge unreturnable serve after another, Kerber’s shoulders seemingly pressed down by the weight of the inevitable. At one point we could see Beyoncé, who was watching from Serena’s player box, marveling at the athletic display, smiling in approval. “I have, yeah, definitely had some sleepless nights, if I’m just honest, with a lot of stuff,” she said afterward. “Coming so close. Feeling it, not being able to quite get there. But, of course, she’s not anyone else on tour. She’s the one who has been walking into locker rooms all around this country, whistling The Farmer in the Dell and daring someone to defy her. The only person on paper who has truly been her rival was her sister, Venus. The only person who has truly been her rival on the court was herself. When she believes in herself, when her mind’s clear, when she decides to walk in her power, there is no stopping her: 13 aces, 33 winners against just nine unforced errors against Kerber, a top five player.